Brigg Town CIC made it three home wins on the bounce to take a three-point lead at the top of the Balcan Lighting Supplies Lincolnshire League table after a 4-1 victory over second-place Lincoln United Reserves. Immingham Town opened their account for the season, whilst making it back to back defeats for Cleethorpes Reserves after a 3-0 scoreline. Moorlands hit Nettleham for seven, Ruston Sports saw off Wyberton by two goals to nil and Gainsborough Trinity came away from the Lucarly’s with a 3-1 victory. Horncastle edged out Louth Town in the only midweek encounter. A late Michael Harness goal in a tight and frantic affair secured Horncastle their second win of the season under the lights on The Wong. Despite a spirited effort small margins cost a Louth side who are still in search of their first win of the season. Reece Moody and Jake Reed were again amongst the scoring as The Zebras came from a goal down to inflict defeat on Lincoln United for the first time this season. Josh Toynbee scored for the visitors after just four minutes. 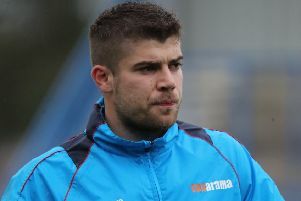 Chris Rodgers equalised 10 minutes later, but it wasn’t until the 76th minute when Moody gave scored his sixth of the campaign to give his side the lead. Jake Reed ended any hopes of a comeback with a late brace, ensuring his side opened up an early three-point lead at the top of the table. Immingham Town had yet to gain a point going into the north east derby, and faced a Clee side who had already recorded impressive away wins over Rustons and Wyberton. This didn’t phase The Pilgrims, however, who scored three second half goals to claim all three points on the day. Daniel Simpson opened up the scoring, before Carl Price added another two to make it short and happy trip home. A Charlie Lofts penalty wasn’t enough to see off a clincial Gainsborough side who were determined to secure their first win in three outings, and did just that. Trinity have now had eight different scorers this season, whilst Lofts has scored three of Grimsby’s five goals. Nine goals were scored in total as a rampant Moorlands side put seven past The Nettles to make it two wins out of two in the league. Sean Cann grabbed his first hat-trick of the season, whilst Hiatt, Anderson, Firth and Johnson also chipped in. Like Cann, Jack Higginson took his tally to five in just two games, but his side fell well short in getting anything out of the game on this occassion. Both sides were looking to make it back to back victories coming into the game, but it was last year’s champions who claimed the spoils on the day. Alex Mackinder opened up the scoring and his account for the season in the eighth minute, but it wasn’t until injury time when the visitors made sure they left with all three points after Ben Sharpe fired home.